Burberry will launch Burberry Sport Ice in February. The new fragrances for men and women are flankers to 2010's Burberry Sport duo. 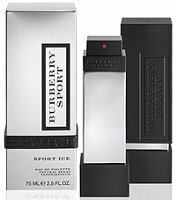 Burberry Sport Ice for Men (shown) features frosted ginger, citrus, ice crystals, woods, amber and musk. Burberry Sport Ice for Women includes notes of ginger, mandarin, ice crystals, magnolia, honeysuckle, petit grain, warm sand, musk and cedar. *sniffs icicles outside window* Nope, ice crystals have no scent. They actually *sound* like things I might like, though I’ve so far loathed every single thing they’ve done except Brit Red, which I love. Oh – and which also has ginger in it. Hmm. Brit Red was good, & I thought Brit Gold was too. They should have called it Snow Sport instead of Ice Sport. Snow does have a smell, and i happen to think it would be great in a fragrance. It kind of doesn’t matter to me: they’re all synthetic chemicals. The problem with using “Snow” is that it is slang for coccaine in some circles. to make these sport fragrances even more FRESH. This one should be interesting. I’m not sure I will like it, but I’ll at least go into it with an open mind. Another flanker I am going to hate straight away because it will make my nose bleed. Ooops! Not because of the snow, y’all , I am really allergenic to some ingredients in this line.